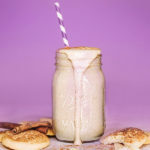 With this Vegan Snickerdoodle Shakeology recipe, we took everything we love about the delightful, buttery cookies rolled in cinnamon, and made a healthy vegan smoothie that we can drink without guilt. It’s lightly sweetened with maple syrup and vanilla, and blended with lots of cinnamon. Don’t have Shakeology yet? Get all the Shakeology flavors here! With this Vegan Snickerdoodle Shakeology recipe, we took everything we love about those delightful treats, and made a healthy vegan smoothie. Place almond milk, ice, Shakeology, cinnamon, maple syrup, and extract in blender; cover. Blend until smooth. An occasional snackional or enjoy as part of breakfast.